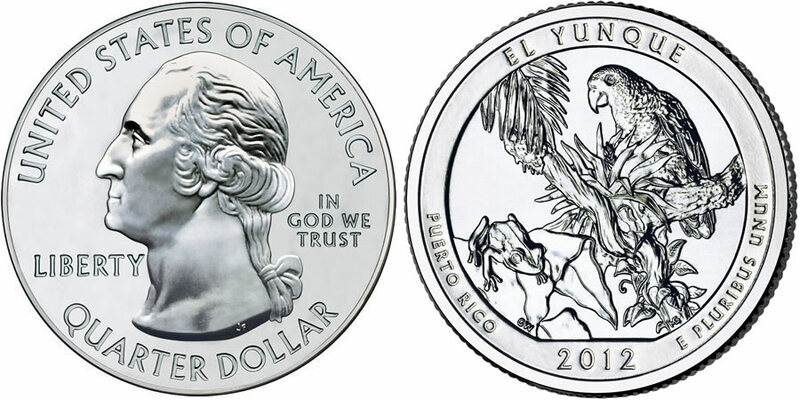 Released as the first 2012-dated strike in a series of five ounce silver collectible coins is the 2012 El Yunque Silver Uncirculated Coin. Shown on the reverse is a design honoring El Yunque National Forest found in the United States territory of Puerto Rico. The coins are issued as part of the America the Beautiful Five Ounce Uncirculated Coin™ series which features reverse designs emblematic of selected sites of interest from around the United States and its territories. Each is composed of five ounces of .999 fine silver and struck to a diameter of three inches. The series is considered the numismatic versions of the US Mint's America the Beautiful Bullion Coins which also feature those same specifications. Those looking to easily tell the two series apart will want to check the coin for a mintmark. Those strikes with a 'P' mintmark on them are the uncirculated coins, the bullion pieces have not mintmark. El Yunque National Forest was established as Luquillo Forest Reserve on January 17, 1903. It has the distinction of being the only tropical rain forest in the national forest system. The obverse of each America the Beautiful Coin is based on the circulating quarter dollars also issued by the US Mint and known as the America the Beautiful Quarter Dollars® Program. This means each coin contains an image of George Washington on the obverse as originally designed by John Flanagan. Obverse inscriptions include UNITED STATES OF AMERICA, LIBERTY, IN GOD WE TRUST and QUARTER DOLLAR. The reverse of each strike contains the design emblematic of the selected location, in this case El Yunque National Forest. The chosen design was completed by Gary Whitley and sculpted by Michael Gaudioso. According to the US Mint it "depicts a Coqui tree frog sitting on a leaf and a Puerto Rican parrot behind an epiphyte plant with tropical flora in the background." Reverse inscriptions include EL YUNQUE, PUERTO RICO, 2012 and E PLURIBUS UNUM. "999 FINE SILVER 5.0 OUNCE" is inscribed on the coin's edge to indicate its weight and fineness.